We rate this as four bottles owing to its combination of really good track side viewing in an otherwise slightly inconvenient location. Brits looking for on site camping but in a safe and well supported environment. None, other than to be aware of location and distance to the village. Some areas prone to flooding in wider parts of Beausejour. Experienced private operator in good location. Its a walk to anywhere but the great trackside view. 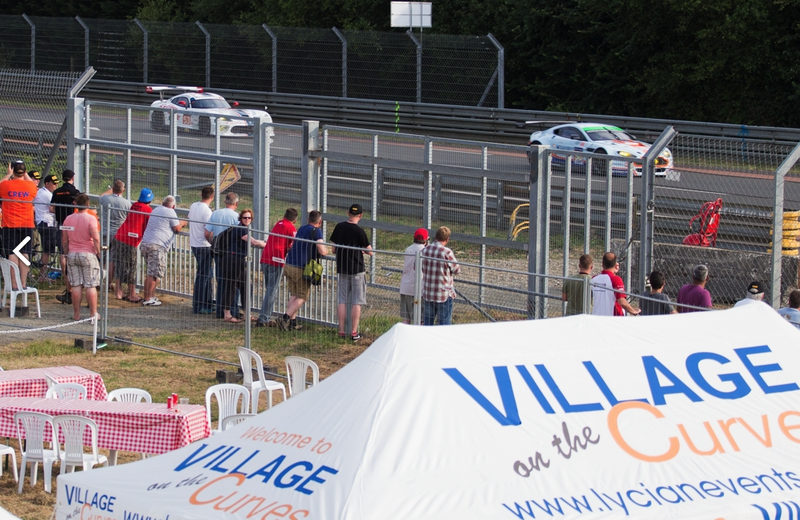 Private viewing area on inside of the Porsche Curves. Mixed crowd both in private site and next door on BSJ may not be to everyone's taste. On the inside of the Porsche Curves within the Beausejour campsite. Access is straightforward. Another successful year camped here every year. Toilets clean, and looked after showers as well. Food on site not the cheapest but you have a choice. Security friendly doing there best and helpful. Eat on site or off make your own. Location makes this site special right on the Porsche Curves. Can view race, from inside the campsite or two min walk to the bank to view. Nice friendly people,always there to help. Our first Le Mans, this is where we camped, brilliant set-up, good facilites, security and excellent catering by Relish. Little passing traffic so nowhere near as much dust as in the rest of Beausejours. As well as Porsches (including 4 of the front engined variety!) we had a Noble M12, TVR, Aston Vantage, 2 Lambos plus a number of "shopping trolleys" - we even allowed BMW's on site! We felt really sorry for the other campers we passed en route to the exit - massive queues for showers etc, plus all the dust from passing traffic, and much larger sites - Lycian did a marvellous job, both "up front" and on site, staff were great, minibus very handy (until the traffic got silly), draught bitter and lager as well as really good food in the Relish marquee - big screen TV so watched Jenson triumph in Canada on Sunday evening, what a way to end the weekend! Big thumbs up for this site!! Open cold wash sink for cleaning plates etc. Ladies wash block - 2 toilets, 2 showers (hot and cold), washbasins. Gents wash block as above. Other end of site - 2 portable loos. Dedicated 24 hour security guards - 3 on duty on the "busiest" night! Relish catering providing food and drink at acceptable prices from about 7am until 1am. Food was excellent - better than many restaurants! Bitter (on draught! ), lager, cider and wine (no spirits). Highly recommended - we took no food with us, ate almost exclusivly on site (and drank lots of their bitter)! Discount available for pre-booked 3 and 4 day meal deals. 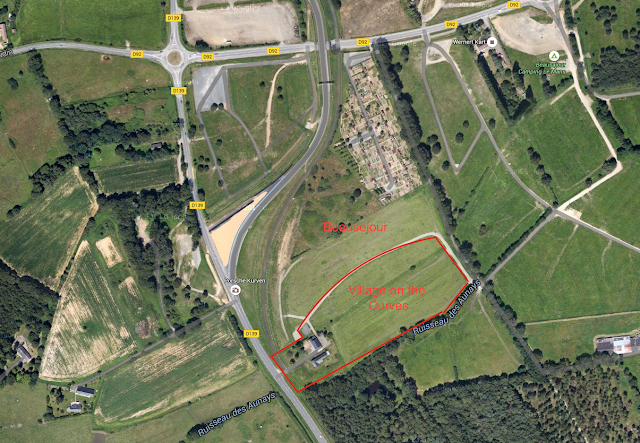 Plots were 7m deep x 5m wide, either side of the "one way road" around the site. All plots pre-marked with numbered pegs so no arguments about plot limits! 14 seat minibus running (when possible due to traffic) hourly service to and from Maison Blance and/or Antares. Wife and I would have no hesitation in recommending this site. Friday night was noisy due to music from a (?German) mob between the site and the viewing bank, loud music until 5 15am, other than that little problem of noise or rowdiness. The location also means there is not a lot of traffic, hence nowhere near the dust problem of sites closer to the entrance. 30 minute walk to MB entrance when traffic is silly. 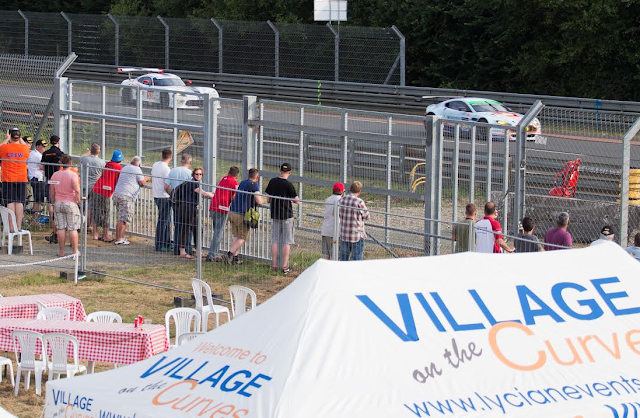 After six successful years on the Porsche Curves we intend to be there again in 2016.. Camping on the Porsche Curves is truly the only way to see this magnificent race and experience the most exhilarating and exciting atmosphere.